This blog post was written by postgraduate student Andrea Honig as part of the course, Research Methods in Ecology (Ecol608). Kathrin Affeld did not choose an ordinary topic for her PhD thesis at Lincoln University. 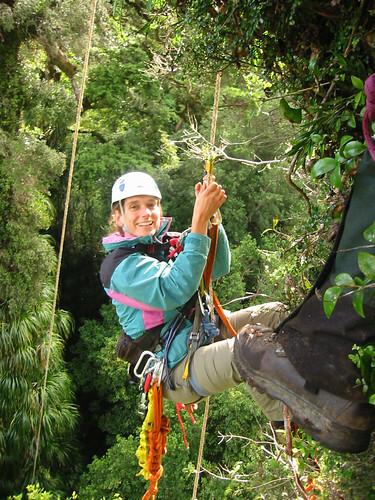 She and her team of scientists carried out a research project on the invertebrate fauna high up in the canopy of northern rata trees on the West Coast of the South Island of New Zealand. Northern rata, or Metrosideros robusta, in the family Myrtaceae, are tall emergent trees in New Zealand's temperate rain forests and before Kathrin's work their canopies were unchartered territory for science. Her project would be a real pleasure for all the outdoor climbing fans among us. Kathrin and her colleagues decided to sample epiphyte mats directly, because conventional methods, such as insecticide fogging, would not be appropriate for capturing all invertebrates, as any individuals in funnel shaped plants or thick humus layers would be missed. Each sample had to be detached from the bark and transported carefully in plastic bags to the lab. Invertebrates were extracted using Berlese funnels over several days. Berlese funnels are a common method to extract invertebrates from soil or litter samples. 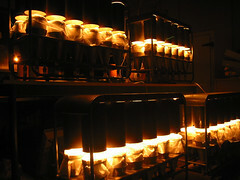 Heat produced by a light bulb dries the sample. Invertebrates will move away from the light and heat and fall down the funnel through a mesh into a preservative fluid (for example, ethanol). To make sure all invertebrates were extracted the researchers washed all remaining organic material over three stacked sieves with their mesh size decreasing from 1.7 mm to 75 μm. Identification could be conducted by expert taxonomists for most species to family level, but it was a great challenge to go further and just 16.2% were assigned to species level. There were at least 10 new species found and one new genus, although there is likely to be many more species new to science amongst the many specimens that could not be identified to species. All of the species collected in this study can be viewed at the Entomology Museum at Lincoln University, Canterbury, New Zealand. Data analysis showed that the study reflected only a portion of the real biodiversity in the podocarp-broadleaf forests canopy. This portion already indicated a highly diverse invertebrate fauna, both functionally and taxonomically (more than 242,000 invertebrates were collected). Results were presented in a 17 page long table giving important baseline information to each species, site where they were found, sampling time, feeding guild and their status, if they are endemic, introduced, cosmopolitan or native. The most interesting discoveries included the following. Several undescribed and new species in epiphyte mat habitats (>10 new species). Extended geographical ranges for various species. Large arboreal ant colonies; until this study they had been known as solely ground nesting species. Relatively small numbers of exotic insect species (7 species, all in relatively small numbers); this information is very important for assessing invasion risk. This study was the first invertebrate inventory of New Zealand forest epiphyte habitats. It provides important baseline data for conservation of biodiversity in New Zealand's forests. However, it also highlights how much we have yet to learn about the amazing bio-diverse canopies above our heads. For detailed information on this study see Affeld et al. 2009. Affeld, K., Worner, S., Didham, R.K., Sullivan, J. Henderson, R., Malumbres Olarte, J., Thorpe, S, Clunie, L, Early, J, Emberson, R., Johns, P., Dugdale, J., Mound, L., Smithers, C, Pollard, S., and Ward, J. 2009. The invertebrate fauna of epiphyte mats in the canopy of northern rata (Myrtaceae: Metrosideros robusta A. Cunn.) on the West Coast of the South Island, New Zealand. New Zealand Journal of Zoology 36,177–202.